Curious to see how we grow and store veggies through the winter? Join us on a fall Farm Tour for a peek in our greenhouses and a walk through the fields. 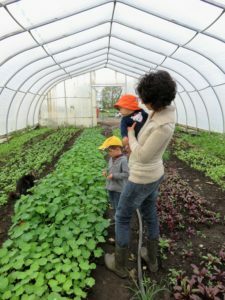 Learn about our innovative heated greenhouse system that keeps greens growing all winter long, and supports our Winter CSA. Tours are free, and will be held Sunday, September 24th at 2 pm, and Saturday, September 30th at 10:30 am. Our farm is about 75 minutes from downtown Ottawa. To register, please email Leela@bluegrassfarm.ca with your preferred date and the number in your party. Directions will be sent to those who register.